I made the most of the sunshine today, delivering 2 sessions in the great outdoors! First up was a session for passers by in the market square in Market Harborough delivered for the local district council. There was a great atmosphere with a number of young people joining in on their way home from school as well as families and shoppers who all enjoyed a chance to play! Next up was the Leicestershire & Rutland Sport 2013 Business Games at Charnwood College. 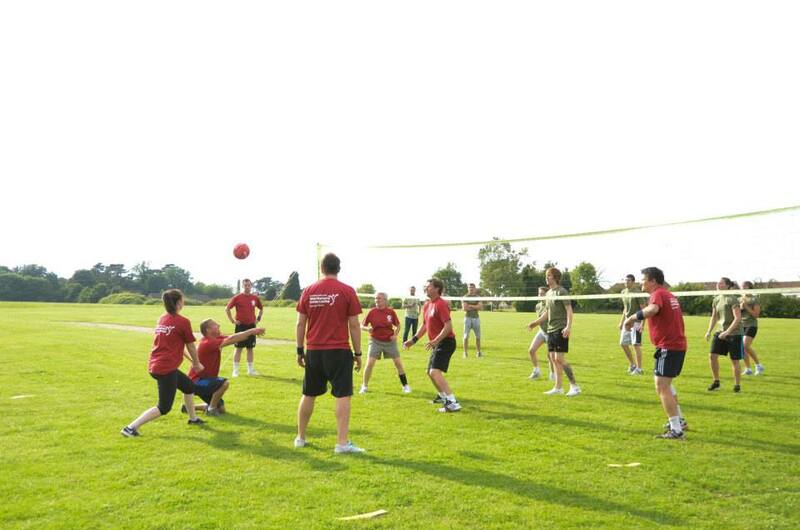 This was a little bit different to normal as it was standing volleyball rather than sitting but it was still great fun! 16 teams competed in a range of sports including volleyball. After a very basic introduction to the rules we got straight into the games. After everyone had played 3 times, the ‘Legaxy Wizards’ had scored the most points and were crowned the champions of the volleyball competition before later being named as the overall winners. The competition wasn’t just about winning though and all the teams showed huge improvements across the evening and most importantly got to have some fun, enjoy the sunshine and tuck into the very tasty hog roast! Overall it was a great way to spend the day playing lots of volleyball and making the most of the weather!